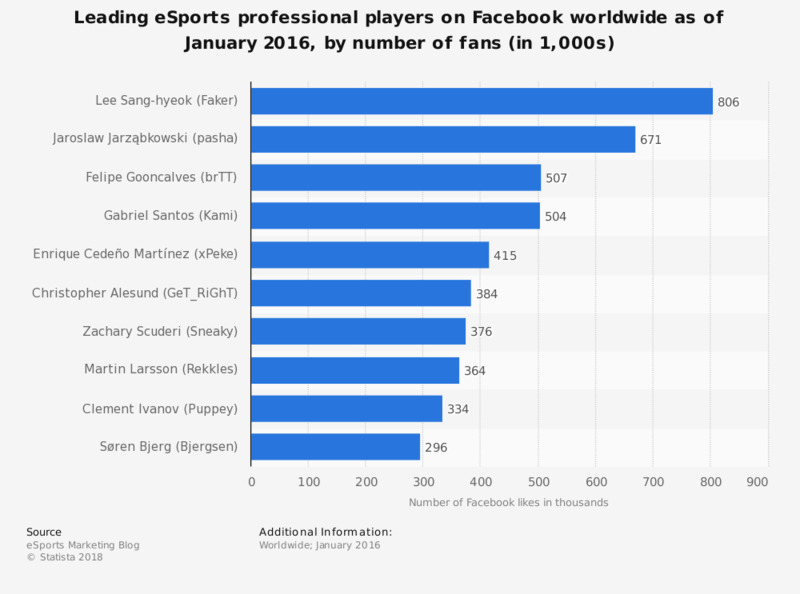 The graph shows the leading eSports professional players on Facebook worldwide as of January 2016, ranked by the number of fans. As of the measured period, Lee Sang-hyeok, a player from South Korea also known as Faker, was the most famous on Facebook, with 806 thousand fans. He was followed by Jaroslaw Jarzabkowski, aka Pasha, who gathered 671 thousand fans on Facebook. The source provides the following explanation to the methodology: "The following data only takes professional eSports players into account who participated at the premier tournaments of 2015 (in Dota2 and CS:GO) or are participating at the League of Legends Championship Series 2016 (LCS) and its equivalents in South Korea, China, South East Asia and Brazil. By looking at the data, please be aware of the fact that services like Facebook, twitter or twitch.tv are not used by all professional players; especially players from Asia use Asia-based services."